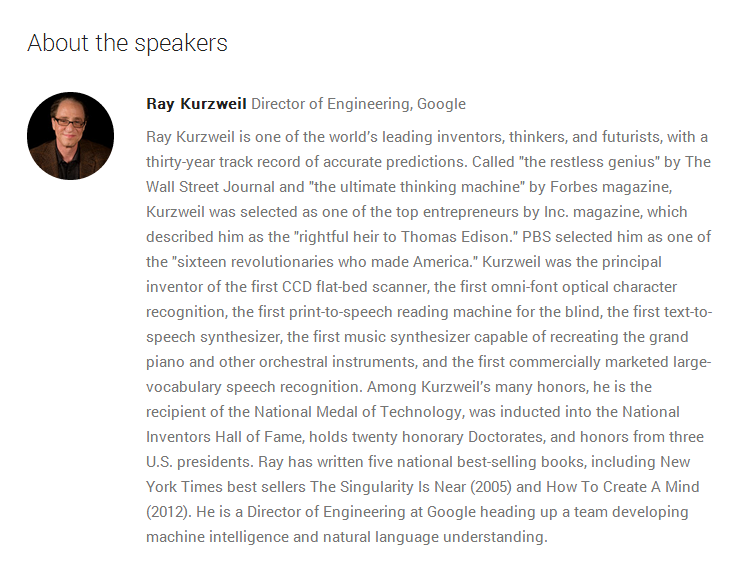 HomeblogGoogle I/O 2014 | video: Ray Kurzweil presents "Biologically Inspired Models of Intelligence"
Google | For decades Ray Kurzweil has explored how artificial intelligence can enrich and expand human capabilities. In his latest book How to Create a Mind, he takes this exploration to the next step: reverse-engineering the brain to understand precisely how it works, then applying that knowledge to create intelligent machines. 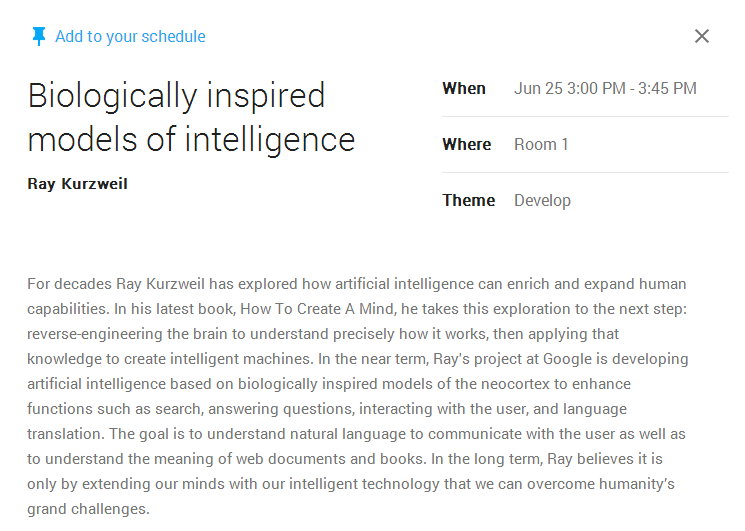 In the near term, Ray’s project at Google is developing artificial intelligence based on biologically inspired models of the neocortex to enhance functions such as search, answering questions, interacting with the user, and language translation. The goal is to understand natural language to communicate with the user as well as to understand the meaning of web documents and books. In the long term, Ray believes it is only by extending our minds with our intelligent technology that we can overcome humanity’s grand challenges. Google I/O | From making your apps as powerful as they can be to putting them in front of hundreds of millions of users, our focus at Google is to help you design, develop and distribute compelling experiences for your users. At Google I/O 2014, happening June 25-26 at Moscone West in San Francisco, we’re bringing you sessions and experiences ranging from design principles and techniques to the latest developer tools and implementations to developer-minded products and strategies to help distribute your app. Breakout sessions: This year, we’ll once again bring you a deep selection of technical content, including sessions such as “What’s New in Android“and “Wearable computing with Google” from Android, Chrome and Cloud, and cross-product, cross-platform implementations. There will be a full slate of design sessions that will bring to life Google’s design principles and teach best practices, and an update on how our monetization, measurement and payment products are better suited than ever to help developers grow the reach of their applications. Sessions from Ray Kurzweil, Ignite and Women Techmakers will take the stage and make us uncomfortably excited about what is possible. The first sessions are now listed, keep checking back for more. Google I/O | Relive the moments of Google I/O 2013, including the keynote, sessions, developer sandbox and after hours.